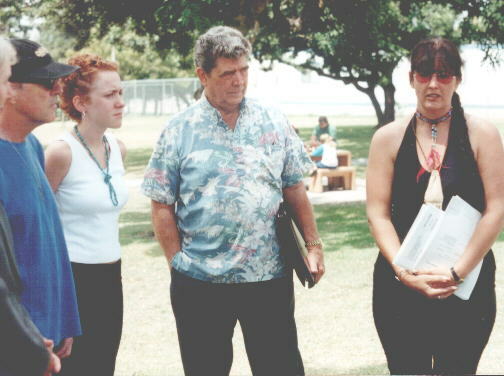 (August 22, 2001) -- Against a backdrop of Scherer Park land that City Hall wants to consume for a 2.5 acre north division LBPD station, local park advocates and their attorneys announced the filing of a lawsuit alleging violations of city, state and federal laws that could effectively force the project's reconsideration or potentially stop it entirely. The suit was filed on behalf of S.T.O.P. (Stop Taking Our Parks) and California Earth Corps. (Photo, left to right: STOP Vice President Reggie Bannister, attending guest, Earth Corps' President Don May, STOP President. Gigi Fast Elk Porter, holding copies of court papers). The petitioners are represented by environmental and land use litigators Jan Chatten-Brown and Doug Carstens. The L.A. Superior Court suit (officially termed a Petition for Writ of Mandate) alleges violations of the California Environmental Quality Act (CEQA), state and federal park preservation laws and the LB City Charter and Municipal Code. LBReport.com has posted the filed action in pdf form on a link below (minus its legalistic attachments). As previously reported on LBReport.com, Ms. Porter and Mr. May (plus Ann Cantrell, not a party to the suit) earlier filed a City Hall appeal that triggered a Council hearing last month at which they challenged City Hall's Environmental Impact Report and attorney Chatten-Brown advised the Council of legal defects she saw in City Hall's record. The Council voted 8-1 (Grabinski dissenting) to proceed with the project. "Every step of the way, we attempted to avoid litigation, that was our position all along. Obviously, the city does not understand anything except litigation," Ms. Porter told LB media at the outdoor news conference. 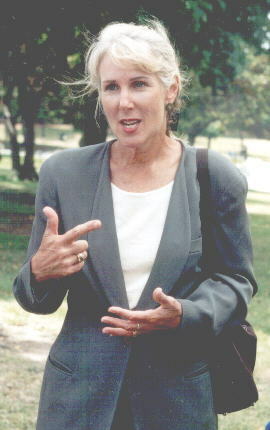 They considered three alternatives: a no-project alternative, which was obviously unacceptable due to public safety concerns; the Dooley's Hardware alternative where, it turns out, by the time the matter came to the decision makers, the property was already in escrow to the Long Beach Unified School District, they were well aware of that and still retained it as an alternative. And the Atlantic Plaza alternative, which again, decision makers knew that there was an oil pipeline through the properties that from their perspective, amongst other things, made those alternatives infeasible. CEQA requires that there be a feasible alterative to the proposed project. In this case, the City Council determined that both the Dooley's Hardware and the Atlantic Plaza alternatives were infeasible. That by itself renders the EIR inadequate. We don't believe that there is substantial evidence to support many of their findings. One of the primary factors in determining that those alternatives were infeasible were economic ones because they did not attribute any cost for land acquisition here. There is a price that you pay when you take public park land, because public park land is valuable. I think the estimate was a million dollars an acre for this land. And in fact, because this park was in part acquired by federal funds, the Land and Conservation Act, requires replacement of park land. In the EIR they said that was unmitigatable because they didn't have the funds for it. When they approved the project they included a mitigation measure that requires one to one replacement, but that mitigation measure does not designate where. We understand that it's the site of a prior landfill. It does not serve the same community. It's not of comparable value...That is not an acceptable alternative under either CEQA or, we believe, the Land and Conservation Act. Ms. Chatten-Brown said the suit would likely be heard in roughly six to nine months and she would go to court immediately to seek a stay if City Hall tried to proceed with the project despite the pending legal action. She added, "[P]olice officers are being forced in a situation where they are staying in what's clear inadequate facilities during this litigation. Unfortunately, it was the decision makers of the city that refused to open the process, refused to have a fair process, and they're the ones who are ultimately responsible for this." This idea that instead of looking at the General Plan as a guidance document for the future of the city but as something that can amended at whim...Rather than looking at a plan for the city, they continue to spot zone their way through. They continue to pick away at things, totally outside of the general plan, change them on whim as a backroom deal...That's not the way you plan a city. That's not the way you have a city being sustainable, reaching goals, being a livable city. That's a pathway to chaos. 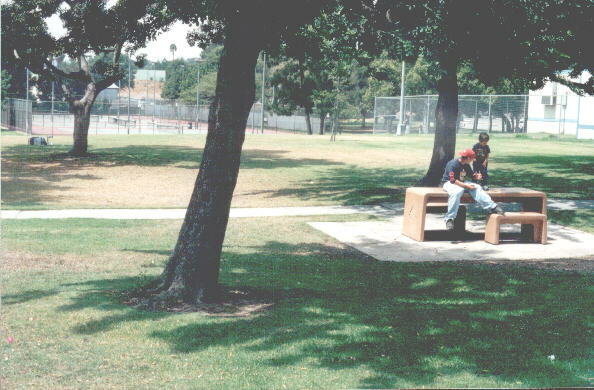 The pattern of behavior by city leaders seems to be that parks are just (non-recreational) development opportunities. If this station is built in Scherer Park, we can expect to see fire stations, police stations, schools, and institutional buildings going into parks all over the city. The Indians believed that we make every decision for today for the seventh generation to come...It is for the children...I am also a mother...and children mean a lot to me. I am now a grandmother. Is this park going to be around when my grandchild's old enough to come visit it? Not if they put this police station here, because if they put it here, and we've been told by insiders in [city] staff, stop it. Stop it here at Scherer, because if you don't, no park is going to be safe in Long Beach. Readers can view the legal filing by clicking while on line: Scherer Park lawsuit.